Nathalies sleek profile is typical of French Empire period beds, with the uncluttered, neo-classical looks of the era. From the column detailing on the head and footboards to the solid brass embellishments, its minimalist design makes it a suitable for a wide range of interiors. 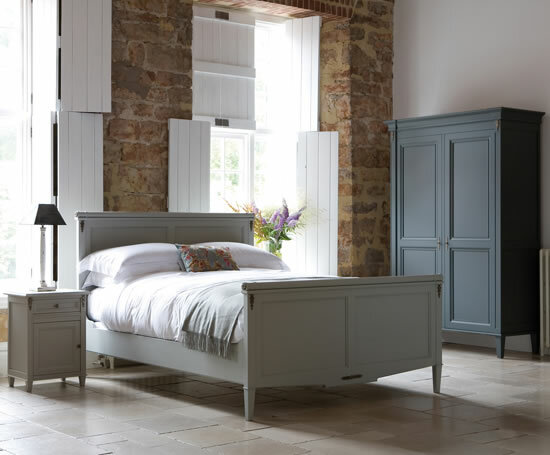 The bed can be finished in a choice of Farrow & Ball colours, creating a whole new palette for bedrooms. From sophisticated neutrals to the stronger tones, they can also be specified for the matching Nathalie bedroom furniture. The complementary furniture shown above is the hand painted Nathalie bedside table, and 2 door wardrobe. Nathalie beds are available in a choice of four standard sizes and custom sizes are available on request. And So To Bed recommend the Royal White bed linens and cashmere throw for use with the Nathalie bed.